TRD Pro Series 17in Matte Black Alloy Wheels. 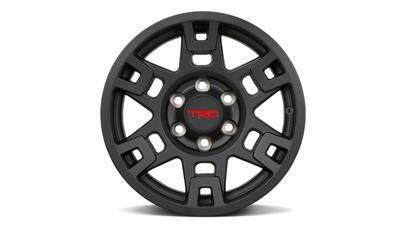 Fits 6-Lug Tacoma, FJ Cruiser and 4Runner. You bought your Toyota for a reason. Keep it in excellent condition by taking care of it with Genuine Toyota parts! All Genuine Toyota parts are backed by a 12-month, unlimited mileage warranty and are manufactured with the quality and reliability you expect from Toyota. If item is discontinued or has an extended wait time, we will contact you via email to let you know . Toyota parts are warranted for 12 months from the date of purchase. Labor is not warranted for over the counter replacement parts, unless the org. part was installed by a authorized Toyota dealer.